Are you a first time home buyer? Are you buying a new home in St. Charles, St. Louis, Kansas City or anywhere in the State of Missouri. Here is some help not only for FHA mortgages but for anyone getting a new mortgage. I have been a Mortgage Loan Officer in the St. Louis and St. Charles area for nearly 20 years and here are some of my TOP Do's and Don'ts for a First Time Home Buyer, FHA Mortgage or anyone buying a new home in Missouri. This isn't your typical list but it is the Top 10 of what I have seen and experienced after having closed 1000s of home loans for first time home buyers, less then perfect credit borrowers, FHA, VA, USDA and all the loan programs. Don't Go Looking For a New House with your real estate agent unless you are shopping with a pre-approval letter in your hands. Don't Go Home Shopping Without A Real Estate Agent. A real estate agent working as your buyer's agent is a FREE SERVICE to you. Don't Use The Real Estate Agent Selling The House You Are Interested In. Some professionals consider this a conflict of interest. Don't Apply For ANY NEW CREDIT of any kind. This can negatively affect your credit scores and hurt you debt to income ratios. Don't Pay Off Any Collections. Talk with a mortgage professional first. Your FHA mortgage may not require you to pay off all collections. Paying some collections off can hurt your credit score more then leaving the collection in place. Don't Close Credit Card Accounts. Old credit card accounts with zero balances can be you best friend if you need to raise your credit scores. Talk with a mortgage professional before doing this. Don't Write A Sales Contract With A Short Closing Date. This only benefits the real estate agent and not you. Don't Listen To Everything You Hear. There are too many 'experts' trying to give you advice, question all the answers. If it is too good to be true, it usually is when it comes to mortgages. Don't Change Jobs. If this becomes an issue discuss the situation with a mortgage professional. Don't Make Any Large Deposits. All unusual large deposits will need to be explained to an underwriter. 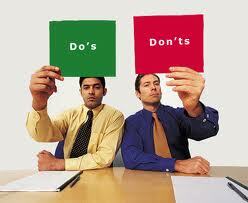 If you don't do it right the underwriter may not count that large deposit to be used at closing. True story, I actually had a couple buying a new home receive a gift of down payment from their Grandmother and then use the down payment money to purchase a new car, one day before closing. Do Stay Current On Your Existing Credit Accounts. Do Get A Home Inspection. Do Read or Have Explain ALL PAPERWORK. Do Call Your Mortgage or Real Estate Agent with any and all question . Do first consult with a lender to get pre-qualified and later pre-approved. Do Know What Is On Your Credit Report. You are entitled to one free credit report annually. Do Shop For The Best Mortgage and Loan Officer. The best mortgage isn't always the lowest interest rate, not all loan officers know what others know. Not all loan officers can do all loan programs. Do Give Yourself Plenty Of Time. Start the home buying process at least 3 to 6 months prior to your lease expiring. Look into the possibilities of month to month lease extensions if starting too late. Do Negotiate Seller Concessions. Did you know that FHA mortgages allow for up to 6% seller concessions to pay for your closing costs, this leaves you with just the down payment and I know all sorts of ways to get you the down payment too. Do Buy A Home. Don't settle for any house buy a home that you are happy with and want to come home to after a hard day at work. I can help you if you are buying a new home in the St. Charles or St. Louis area, actually I can help anyone buying a new home anywhere in the state of Missouri. I specialize working with first time home buyers, low to no down payment mortgages, FHA, USDA Mortgages, FHA 203k, and VA mortgages. If you have any questions please feel free to contact me.